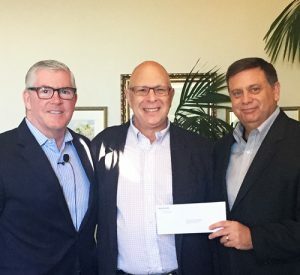 Longwoods International Founder and CEO Bill Siegel presents a check for an initial $15K to DMAI CEO Don Welsh (left) and Visit Savannah CEO and Chair of the Destination and Travel Foundation Board Joe Marinelli (right), to advance the travel and tourism industry via the work of the Destination and Travel Foundation. The donation stems from the research partnership between Longwoods and DMAI - announced in July - to provide special pricing for travel research to DMAI members. For more about this value-added partnership opportunity for DMAI members, click here.